In recent years, Europe has seen a major revival of its resident large carnivore populations. As conservation efforts gain strength, the wilderness is witnessing the return of bears, wolves, lynx and more. Just this month, a new report revealed the status of another predator expanding its European territory: the golden jackal. These canines have spent the past few decades establishing themselves in various countries across the continent. Now, it appears they've made it to northern Germany. Golden jackals were once more widespread across Europe, but as humans continued to expand and swallow up wilderness, the species disappeared from some of the countries it called home, and found itself restricted mainly to the east. By the end of the twentieth century, however, the jackals were regaining territory, appearing in Hungary, Ukraine, Austria, Italy and elsewhere. They've even started settling in countries with no historical record of their presence, such as the Czech Republic. Germany is no stranger to the jackals' northward march. The animals were spotted in Brandenburg as far back as 2002, and in more German states since. Just this month, an individual was found dead on a highway in southern Germany, not far from the Munich airport. The northernmost parts of the country are made up of Mecklenburg-Vorpommern, where jackals were caught on camera last year, and Schleswig-Holstein, where they were spotted for the first time this month. Earlier in May, a farmer reported three sheep killed by a predator along the Baltic coast, and asked for governmental compensation. Authorities initially suspected the classic sheep-nabbing culprit: grey wolves (which have also been making a comeback in Europe). But a DNA sample revealed the presence of golden jackals in the area. German officials aren't yet sure if this particular jackal migrated over from the north, or moved in from another part of Germany. To the north, Schleswig-Holstein borders Denmark, which just a couple of years ago became the northernmost jackal outpost. Golden jackals aren't much like their distant canid cousins in Africa. The species is much more closely related to wolves and domestic dogs – in fact, they're known to hybridise with them. The animals are extremely adaptable, living in a variety of habitats and eating pretty much anything that's available, from fruit to small animals to livestock. Most of the time, these carnivores live with their mate and offspring, so if you see one golden jackal, there's a good chance there are more. Its spread across Europe has brought up questions about whether the species belongs in places outside of its known historic range, and some locals are worried about the impact these new arrivals might have. As you'd expect, farmers in particular are concerned for the safety of their livestock. In some countries, golden jackals are killed for this reason, but in Germany, and much of the rest of their range, they're protected by law. Many are now wondering how best to co-exist with these animals – especially because it appears they're here to stay. The main culprit behind the jackals' surprising expansion? It seems to be … us! 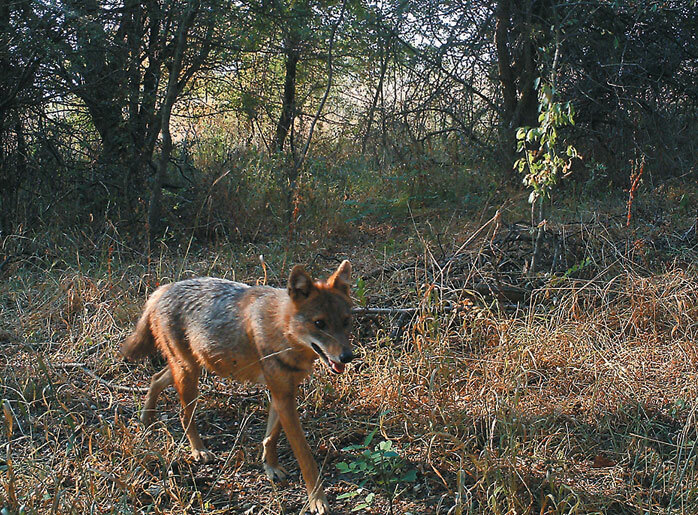 While industrialisation and urbanisation had a hand in the decline of these predators in the first place, in more recent years, human activity has resulted in a changing landscape, the removal of other large predators (like wolves) and increasing global temperatures, all of which are boons for golden jackals looking for a new place to stake their claim. Camera traps in the Czech Republic have captured the furry face of a golden jackal – the first ever recorded in the country. Where did the Falklands wolf come from?